The Tufted Hemp Mattress from Earthsake! 100% Vegan & Pesticide-free! That's right - a Vegan Mattress from Earthsake made without wool and using tufted hemp instead of cotton. Let one of nature’s finest fibers lull you to sleep. Hemp is naturally mold and mildew resistant which makes this mattress very popular in humid climates. The Hemp we use is pure and not treated with bleaches, dyes or other unnatural treatments. Hemp is three times stronger than cotton and twice as resistant to abrasion which makes it ideal bedding material. The inside of our Hemp mattress is layered with hemp batting and a non-toxic white powder (similar to baking soda) to make it fire retardant. That's right - it wont light up and even if it did you cant get high on hemp! Our Hemp Mattress not only uses Hemp on the inside but on the outside too. Its hand-tufted to an outer Hemp fabric mattress cover. With 100% Hemp inside and out our fully-loaded Hemp matresses feel more dense and solid than other innerspring mattresses and are available in three firmness levels. Constructed with a heavy duty innerspring that utilizes different coil gauges to give your body the proper balance and support -Available in Firm (312 coil ct), Extra Firm (510 coil ct), and Super Firm (1,000 coil ct). The Earthsake Hemp mattress uses only nature’s finest Hemp to bring you healthy sleep and remarkable luxury. We recommend using this mattress with its matching Hemp Boxspring - and its even better in combination with one of our all natural mattress pads or toppers. The Vegan Hemp Mattress is made with 100% pure Hemp. Its tempered steel innerspring is layered in Hemp and and treated with non-toxic white powder (similar to baking soda) required by law to make it fire safe. This is the only mattress we offer that does this because no wool can be used for a Vegan mattress. The mattress is then wrapped with 100% pure Hemp. These layers are tufted to a cover of all natural 100% Hemp fiber (unbleached, undyed). Hemp uses no pesticides, and is naturally mold and mildew resistant! • No pesticides or chemicals are ever used to grow our Hemp. Just sunshine and water! • Firm, dense and durable fiber resistant to abrasion. • Derived from the completely legal and natural bark fibers of Cannabis Sativa L (Industrial Hemp)- which has no illicit use or psychoactive chemical properties. • Heat-treated heavy-duty orthopedic innerspring unit available in three firmness levels. 8" high mattress - Sizes: Twin (38x75”), Twin-X Long (38x79”), Full (53x75”), Queen (60x79”), Dual-King (76x79”), and CA King (72x83”). Firmness Options: Firm (312 coil ct), Extra Firm (510 coil ct), and Super Firm (1,000 coil ct). 8'' high matching Hemp box spring - Sizes: Twin through CA King. The Earthsake Tufted Hemp mattress is constructed to be used with its matching Hemp boxspring and there are noticeable differences when used with any other foundation. We also highly recommend using any of our mattress pads or toppers. to create a firmness/softness level you most desire. Alternate turning mattress from end to end and flipping mattress side to side every 2 weeks for the first 2 months. Turn once every 4-6 months thereafter. Vacuum and Air – vacuum and/or air regularly which helps the natural fibers breathe. Stains – Are best removed by simple spot cleaning. Apply a solution of 1:3 parts white distilled vinegar and water (you may also use a natural detergent to spot clean). Spray the solution on the spot, then allow to dry completely. If possible, moving the mattress into the sun to dry is most advantageous. To insure proper ventilation always support mattress/foundation with a proper support system. Ideal support systems are boxsprings or slat systems. If you are placing mattress on plywood or solid surface, it is advisable that the surface be perforated for proper airflow. King/CA-King size bed-frames should have a center support system. Do not place mattress or foundation directly on the floor or on/in damp locations. Do not use the handles when flipping or lifting mattress – handles are designed to guide the mattress into place after flipping. They cannot support the mattress’s weight and will detach if you try to lift the mattress with them. Hemp is naturally mold and mildew resistant which makes this mattress very popular in humid climates. The Hemp we use is pure and not treated with bleaches, dyes or other unnatural treatments. Hemp comes from the same source as marijuana, but marijuana it is not. Hemp comes from the part of the cannibis sativa plant that does not generate a natural high - unless you count the happiness you'll feel when sleeping on this all natural pesticide-free mattress. Because unlike standard cotton Hemp grows well without herbicides, fungicides, or pesticides. Hemp fiber is also longer, stronger, more absorbent and more insulative than cotton fiber. The $11 "California Recycle Fee" is now required by law for each new mattress and boxspring/foundation unit sold to fund the Mattress Recycling & Recovery program. This program was designed to keep used mattresses out of our landfills and recycled into other useful products instead. Earthsake offers 2 options (Silver or Gold) for your mattress home delivery within the continental US. We also offer a Berkeley pick-up service at our warehouse in Berkeley, CA. "LOCAL" Delivery service is within 50 miles of Berkeley, CA. Choose the service that best fits your needs. Delivery rates are based on mattress size and service level. • "Silver Service" is a 2-person delivery, inside the threshold, stair carries (up to two (2) flights prior to the threshold). • "Gold Service" includes inside placement, two flights of stairs, unpacking, debris removal, and mattress set-up. • Additional stair carry is charged at a rate of $3 per step or $30 per floor, whichever is more. • A Non-Standard Delivery/Pick-up Charge starting at $60 will apply whenever a delivery/pick-up outside the "Normal Business Hours" is requested: Normal Business Hours are Mon-Fri, excluding national and state holidays, between the hours of 8am and 5pm. • Saturday or Sunday delivery/pick-up rates available by quote - call us to inquire. • Mattress storage is free for the first 10 days. Mattress storage is $10 per item per day beginning on the 11th day. • Mattress & boxspring/foundation delivery charges are not subject to any coupons or discounts. • Removal of an old mattress or mattress set available by quote - call us to inquire. • Call 877.268.1026 for special requests or deliveries outside of the continental US. Custom made to order - Allow 2-4 weeks for production then 2 weeks for delivery. You can call us to inquire about an ETA for your order. After your items are produced you will be contacted to schedule a date and time for your home delivery or pick-up. The $11 "California Recycle Fee" is now required by law for each mattress and boxspring/foundation piece to fund the Mattress Recycling & Recovery program. This is an Earthsake Mattress. You wont find the Earthsake Solstice mattress anywhere else - so accept no imitations. It says Earthsake on the outside so you know you can trust whats on the inside! Our label only goes on the best local, organic ingredients harvested and transformed into wonderful mattresses, pads & toppers, pillows & comforters - all custom-made in the USA for Earthsake! 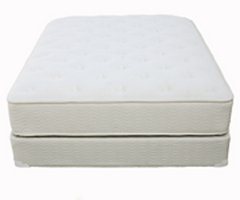 All mattresses come with a standard 20-year mattress manufacturers warranty covering any manufacturing defects. They are also insured to cover any damages caused during a home delivery. Once signed by the receiving party, the responsibility of proper care is yours. In accordance with health code laws, mattresses & boxsprings/foundations are non-returnable & non-refundable.